The measurements will depend greatly on the size of your laundry basket. We used 1.25 bushel Sterilite brand. It’s best to have the employees at The Home Depot cut the 3/4 inch plywood into 15 1/2 inch width pieces for you. For the rails – 1×2 inch pine boards – the rails will be attached to each side once the box is built, at 10 inches from the bottom, then 21 inches from the bottom and 32 inches from the bottom. Spacing will depend on the size of your laundry basket. 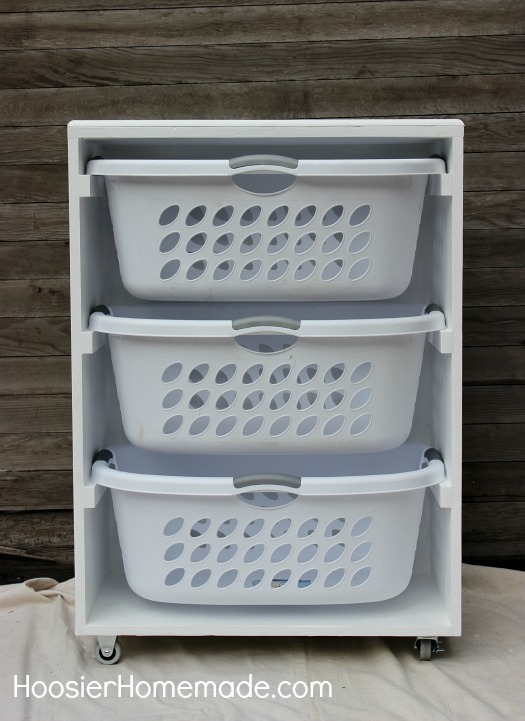 The construction is a simple box, with 1×2 inch pieces of wood to hold the laundry baskets. After cutting the pieces of wood, it’s best to apply wood glue to the joints before screwing them together. 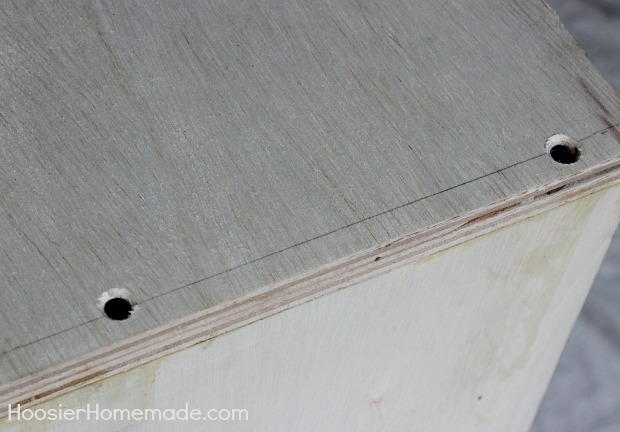 Pre-drill the screw holes with a small drill bit and countersink the holes for a clean finish. 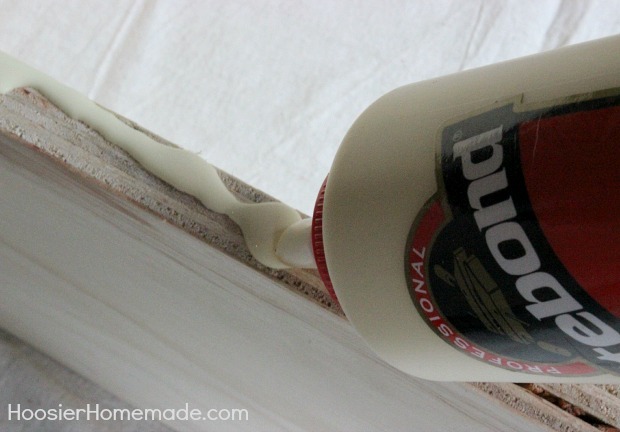 After glue is set and prior to painting, cover the screw heads with wood putty. 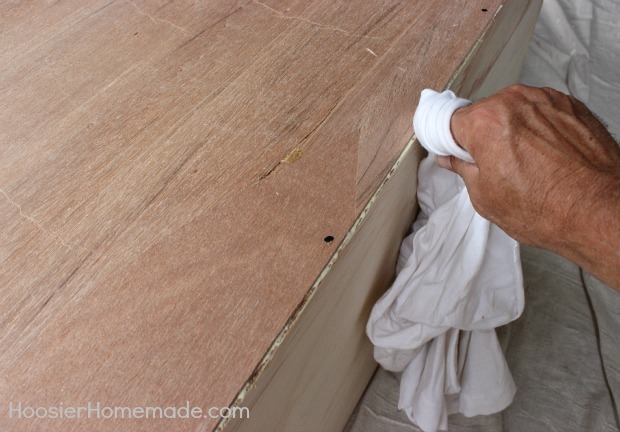 After you have built the sides of the box and attached the back, make sure to clean up any wood glue that has squeezed out of the joints with a clean wet rag. Now it’s time to build the rails that will hold the laundry baskets. Attach the rails to the inside of the box, use the supply list as a guide for spacing the rails. 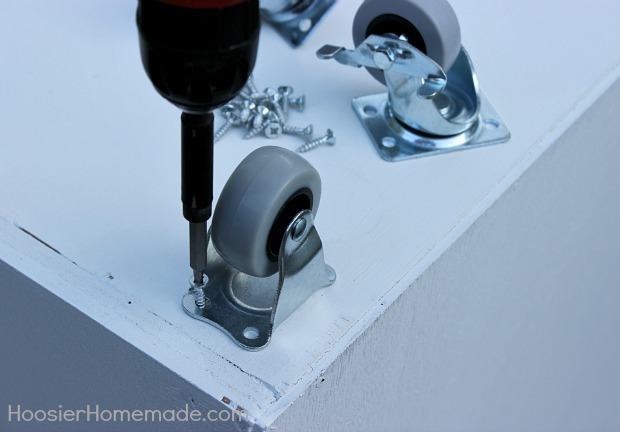 Use a clamp to help hold the rails in place while you glue and screw them to the side. 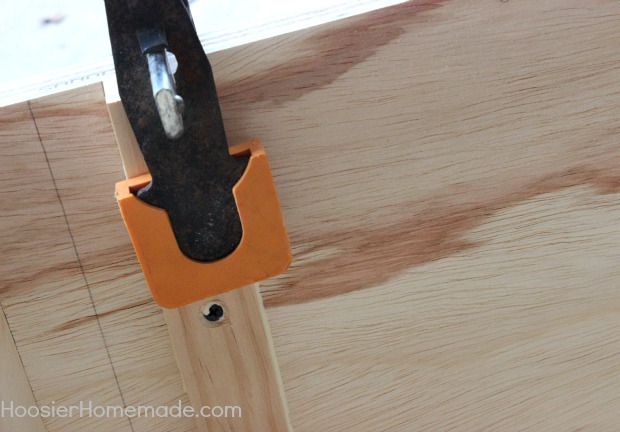 Leave the clamps on until the glue has dried. After the laundry station has been primed and painted, you can add wheels to the bottom if you like. Space the wheels 1 inch in from the corners. 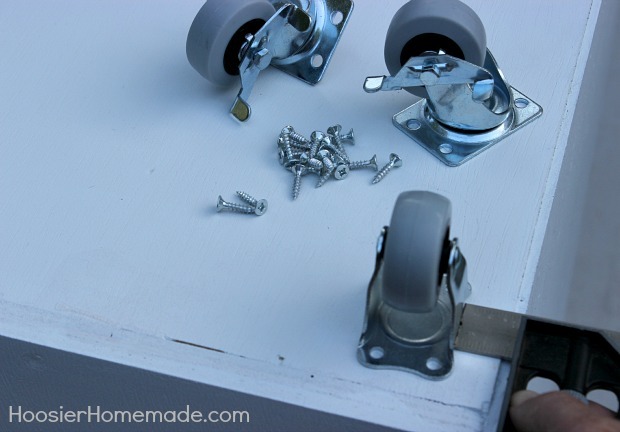 And attach them with the 3/4 inch wood screws. To make clean up easy, we added shelf liner to the top. 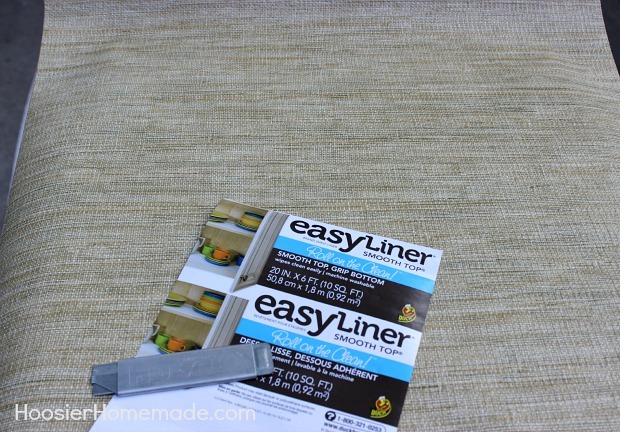 This Duck Brand easy liner is sold in a roll and can be cut to fit the top. Secure with staples around the outer edge. 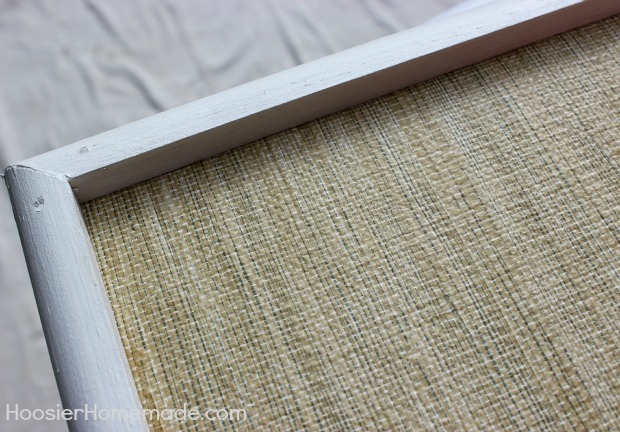 To finish the top, attach wood trim around the edge with finishing nails. This trim can also be glued, but we chose to nail it so it could be removed if the liner needed to be replaced.